30 days producers plans to distribute their movie to the public Free of charge for a limited time... Watch now pay later if you like it!! Grand Terrace, Calif. November 12, 2008 -----The producers of 30 days the movie, are so confident in their work, they have decided to let consumers watch the movie for free and pay later if they like the movie. This is an unprecedented move on the part of the producers, and never heard of industry marketing strategy. Says Toyin, “the Nigerian movie industry is growing so rapidly, and one of the biggest complaints from consumers is the quality of the movies. This has led to almost a stalemate between the consuming public and the producer. The majority of the producers are not willing to invest so much in producing quality movies, and the consumers want to pay as little as possible because of the poor quality.” Something has to give; hence we decided to let the consumers decide for themselves. We are so confident in our product and story line that the whole family will be happy to be part of the enjoyment of watching our movie. The first test of the free screening starts on 11/24/08 and any one can enroll in the program to be among the first 1000 people in the test run. Anyone interested can log on to www.30daysthemovie.com and register to participate. Each participant will be charged $4.99 for shipping and handling within the Continental U.S. (International rates may apply), and will have 30 days to watch the movie. At the end of 30 days, they can keep the movie if they are satisfied and their credit card will then be charged $10.00 or return the movie and no charges will appear on their credit card. Each participant will also be eligible to participate in the drawing for an Apple IPOD or a Free 30daysthemovie T-shirt. TLI is the exclusive Marketing Company for the movie 30 days. This movie highlights the corruption endemic in Nigeria and the consequences that may result if corruption is not addressed. 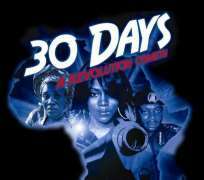 30 days, was written and directed by a Young Nigerian Lawyer, Mildred Okwo. The movie is an action thriller and a political Drama set in various parts of Nigeria. It is the story of Young Chinora, played by Genevieve Nnaji, daughter of the Chief Justice. Chinora and a group of women, having been tired of corrupt Government officials decided to lead a revolution they perceive will eradicate corruption once and for all in their country. Other prominent actors in the Movie include Joke Silva as minister of state and Segun Arinze, as Inspector General of Police. “The film reeks of pervasive vengeance and un-conformist tendencies, which culminates into a richly contrasting pool of the league of rebels who now see themselves as the last bastion in a morally decrepit society. TLI is a privately held worldwide media company with its corporate office located in the heart of the Inland Empire, California. Contact us at [email protected] or call (951) 750-8429.